is supported in sweden. it is a great idea to have information on how much carbon dioxide emissions are created in producing everything that people eat. i myself believe, that the best diet for the environment and humans is a raw fresh fruit diet, preferably local and of course vegan organic. ''Right now, I don't know what this means,'' said Ms Bergstrom, a pharmaceutical company employee. But if an experiment succeeds, millions of Swedes will soon find out. Labels listing the carbon dioxide emissions associated with the production of foods are appearing on grocery items and restaurant menus around the country. Changing diet can be as effective in reducing emissions of climate-changing gases as changing the car one drives or doing away with the clothes dryer, scientific experts say. Some of the proposed dietary guidelines may seem startling. They recommend that Swedes favour carrots over cucumbers and tomatoes. (Unlike carrots, the latter two must be grown in heated greenhouses here, consuming energy.) They are not counselled to eat more fish because Europe's stocks are depleted. And less surprisingly, they are advised to substitute beans or chicken for red meat, in view of the heavy greenhouse gas emissions from raising cattle. Many Swedish diners say it is just too much to ask. ''I wish I could say that the information has made me change what I eat, but it hasn't,'' said Richard Lalander, 27, who was eating a Max hamburger (1.7 kilograms of carbon dioxide emissions) near a menu board revealing that a chicken sandwich (0.4 kilograms) would be better for the planet. Yet if the new food guidelines were religiously heeded, some experts say Sweden could cut its emissions from food production by 20 to 50 per cent. An estimated 25 per cent of the emissions in industrialised nations can be traced to the food, according to recent research here. The dietary recommendations, which are being circulated for comment across the European Union, have been attacked by Europe's meat industry, Norwegian salmon farmers and Malaysian palm oil growers, to name a few. 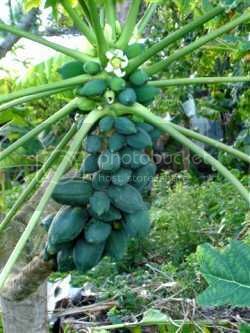 environmentally & human friendly living, life giving pawpaw, as all raw fresh fruit is..